In a stock pot, on medium heat, sautee the garlic in 2 TBSP of EVOO. Once aromatic, add the onion and green bell pepper. Sautee until soft. Add the vegetable broth, tomato sauce, tomato paste, oregano, paprika, cumin, white vinegar, salt & pepper, bay leaf, and olives (optional). Simmer for 45 minutes. Meanwhile, drain and rinse jackfruit. Boil in water for 20 minutes. Drain and shred (you can use your fingers or two forks. It should shred just like pulled chicken or pork) Add the shredded jackfruit to the sauce pot and let simmer for the remaining 15 minutes. Don’t forget to remove the bay leaf when done! 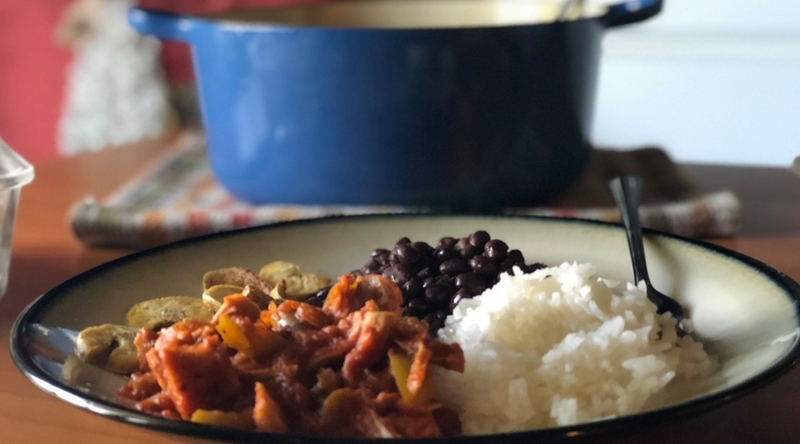 Serve with black beans and rice and some baked plantains. 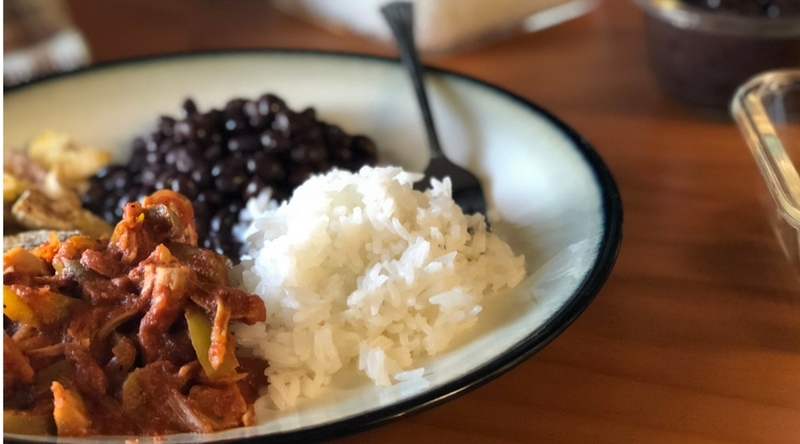 Sprinkle some fresh cilantro onto the Ropa Vieja if you like! 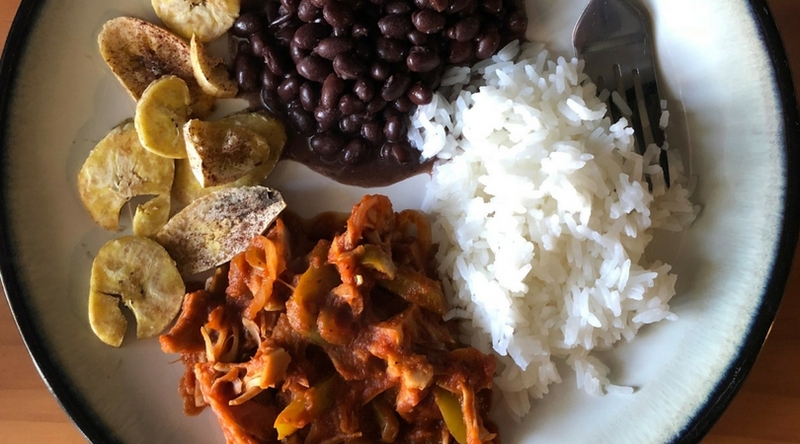 Traditional Ropa Vieja is made with beef. It also takes a LONG time too cook… I’m talking 4+ hours… Ain’t nobody got time for that. This vegan version, and it’s sides, took 1 hour and made about 6-8 servings! I’m trying to eat more plant-based food these days so I’ll have to give this a try. 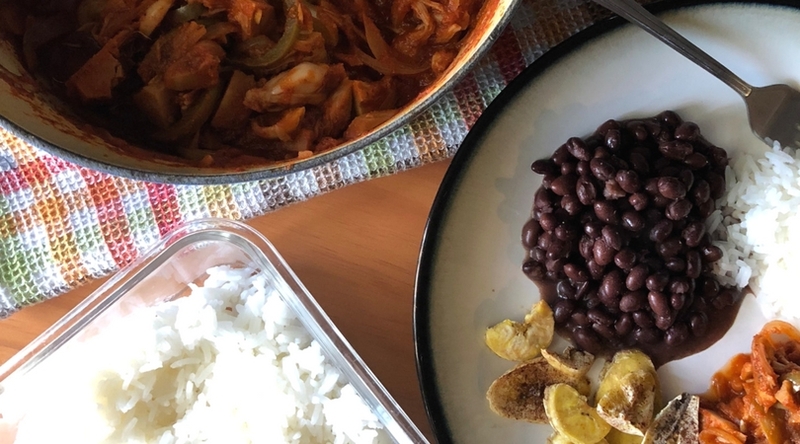 I love plantains so I’m sold on the whole meal! 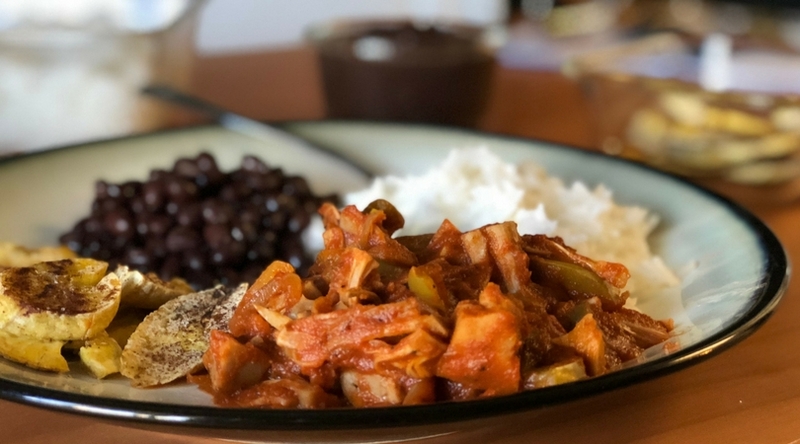 I tried jackfruit for the first time recently and I loved it. Definitely something I am going to be eating more often. This recipe is making me salivate! Looks SO yummy! I have seen recipes for jackfruit which sounds a great meat alternative but now I see you can get this in cans. Brilliant, I will look at for these. This looks very tasty and you cannot tell completely that all of the items are vegan. I think it is time to eat again. 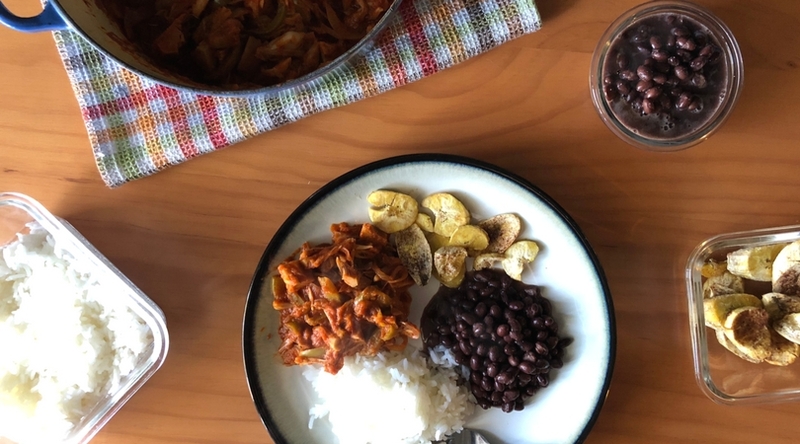 Black beans and Jackfruit is such an unusual combination! I love baked plantains! I love how we vegans get creative with substituition and food! Looks like vegan food are just getting on the top list nowadays. I should give this a try. This looks tasty and wanting to have one now.